As with most situations in life, there is inevitably a minimum of “two sides” to a given story. No matter how objective or impartial we imagine ourselves to be, particularly when it comes to the grayer areas of politics or religion, our opinions are borne out of experiences we’ve had, the way we see the world and the way in which our upbringing and environment have shaped those experiences. Human nature seems to dictate that unless otherwise provoked, we are limited in our ability to see and understand stories outside of our own. I talk incessantly about narrative, and how design can be a vehicle through which stories are shared. I’m not naïve enough to believe that design is the be-all and end-all when it comes to making the world a more empathetic place, however, it just might be one of numerous places to start. Growing up in Goshen has defined me in ways that are sometimes difficult to articulate, and perhaps difficult for others to appreciate. It’s true that many of my classmates and I were united by middle-class privilege, culture, religion, accessibility to resources and families that supported us. However, unlike most of my childhood friends, my family history also includes slavery, segregation, migrant workers, fear of lynching, discrimination based on skin color and backlash against interracial marriage. As fiercely as I guard these stories that define me, and as frequently as I gravitate toward others who share similar histories, I also understand how problematic tribalism can be. My own family, with its cultural, ethnic and racial diversity, is a reminder that accepting some people and excluding others as a way to reaffirm my identity is futile. Nor do any of the challenges I encounter in life serve as justification to treat others with a lack of empathy. Design, by extension, has helped me keep myself in check. My work involves listening, and thinking about ways in which other people experience a space, navigate a site, understand and apply information, or more generally, exist in the world. Though design is a reflection of creative interpretation, it is also the product of a collaborative process. The less aware designers are of the audience we’re trying to reach, the narratives they carry and the way they see themselves in their own cultural context, the less successful we are at our jobs. Maintaining a balance between a healthy sense of self and respect for the voices of others is tricky business. And yet, seeing our individual stories visually represented as part of a larger fabric of narratives honors both our uniqueness and collective experience. 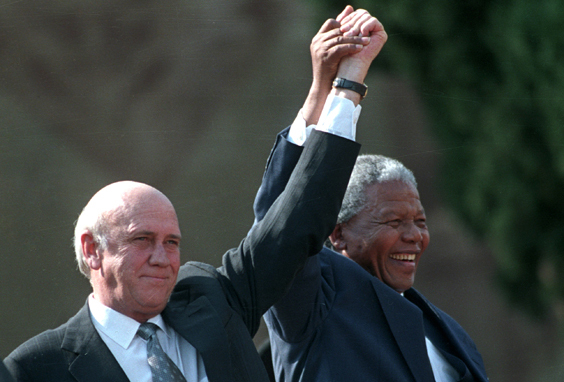 There is no better example of this than the iconic images of Nelson Mandela and Frederik Willem de Klerk—the two South African leaders who negotiated the end of apartheid—holding hands in a demonstration of unity. Despite the “stormy” relationship between the unlikely allies, their stories have become forever entwined, a potent reminder of the power of narrative in healing the wounds of a (formerly) segregated society. Few of us have opportunities to make such a significant impact on an international scale. But in the day-to-day moments when we are tempted to exclude—to overlook, to trivialize, to discount what we don’t understand—and set ourselves apart, it behooves us to remember that we are in fact, still one.